Deer Valley Farm harvesting winter rye for round bale silage just before tilling it under and planting corn. ‘Double Cropping’ or the practice of harvesting two crops from the same field in one year is not a new concept by any means. 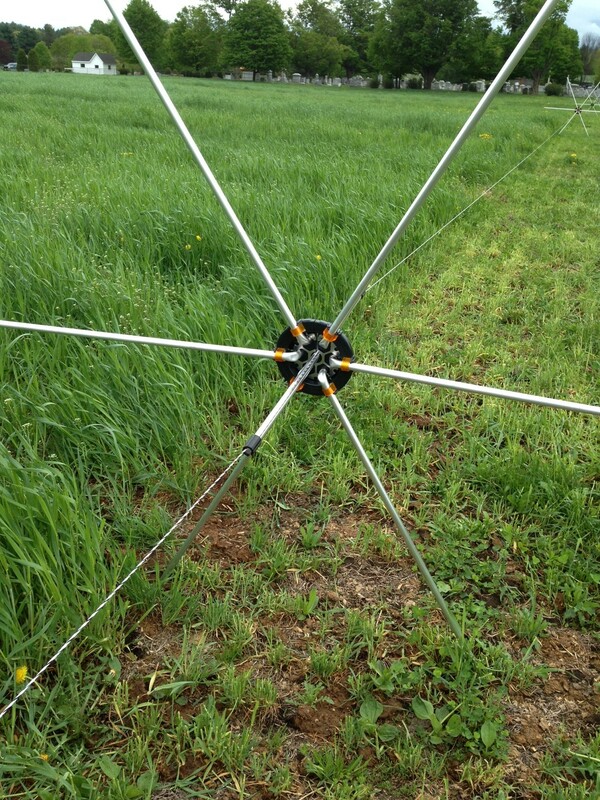 However, as more and more farmers in the Champlain Valley are starting to look at cover crops as part of their crop rotation, it becomes a very viable option to evaluate harvesting them for forage. 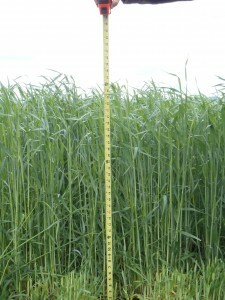 The most popular cover crop planted here in Vermont after corn silage is Winter Rye. Recently, however, we have started to see more and more farmers plant Winter Triticale (a cross between winter rye and winter wheat) for its purported value as a forage crop. 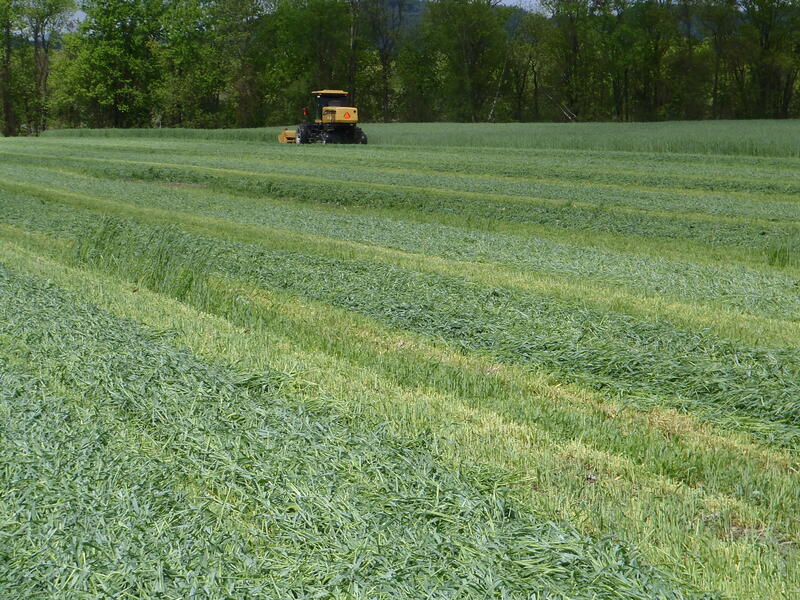 This spring, several producers harvested winter rye and triticale for forage. We were able to collect forage samples in an attempt to compare them to each other and get a better sense of the overall value of these crops as forage. We collected samples from three farms on five fields. 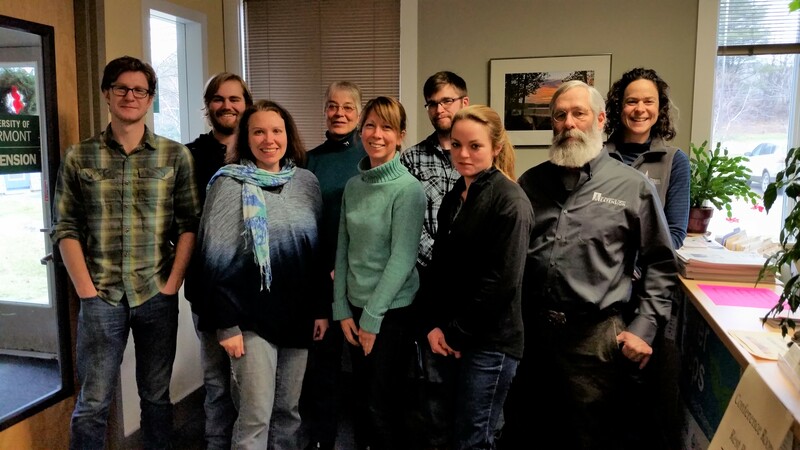 The farms we collected samples from were located in Williston, North Ferrisburgh, and Wells, Vermont. The farms were harvesting these cover crops as baleage or grazing them. We calculated yields and sent the samples for analysis. Below is a table with our results, averaged by crop. The fields were all no-till drilled in late September at between 100 and 150 lbs/acre (after corn silage or into pasture) and harvested in mid-May. All of the crops were fertilized in the spring (with Urea or solid dairy manure). The majority of samples were taken at harvest during the split-boot stage (Feekes stage 10). The yield measurements represent one harvest, and do not account for multiple harvests. 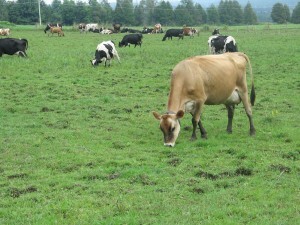 The pasture was grazed a second time in early June and that harvest would increase overall yields. Overall, in our samples, triticale performed better than rye from a forage quality standpoint. 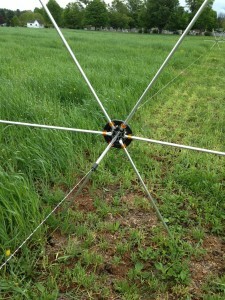 Rye, however, outperforms in yields, sometimes by double. One of our triticale samples tested out at 22% protein when harvested at the split boot stage, but our samples averaged out at 17% CP. The rye was not far behind at 16% CP. We also found that planting at higher rates increased yields and quality. In Alburgh, VT UVM Extension Agronomist, Dr. Heather Darby found similar results with her winter rye planting trials. She found similar dry matter yields over the 2011 and 2012 seasons. They did see lower crude protein levels at closer to 12% (our rye samples averaged 16% crude protein). 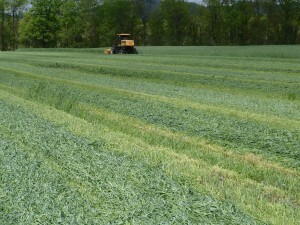 Aaron Gabriel, of Cornell Cooperative Extension’s Capital Area Agriculture and Horticulture Program also collected samples on four fields this May that were each planted to rye and triticale. Although they did not collect yield data, the protein levels were also lower than ours. Rye averaged 12.7% CP while triticale averaged 14.6% CP. Their relative feed values were very close to what we found…both crops averaging well over 100. Like all crops, yield and quality all depend on management. Planting and harvesting in a timely manner, a good fertility program, and appropriate soils will have the most impact on growing a high quality, high yielding crop. In these situations, either crop would fit the bill. If you are hoping to get a crop off early in order to get your long season corn or soybeans established, winter rye might be a better fit. Although dry matter yields are the best way to compare results, it is important to note that from a feed management standpoint, rye yielded up to 4 tons per acre of baleage (assuming 55% moisture) and closer to 5 tons/acre of chopped silage (assuming 65% moisture). Triticale yielded between around 2 tons/acre at 55% moisture and almost 3 tons/acre at 65% moisture. For a cost of $35 per acre to seed these cover crops, a farmer can see a return of between $80 and $200 in feed value (depending on your yields). 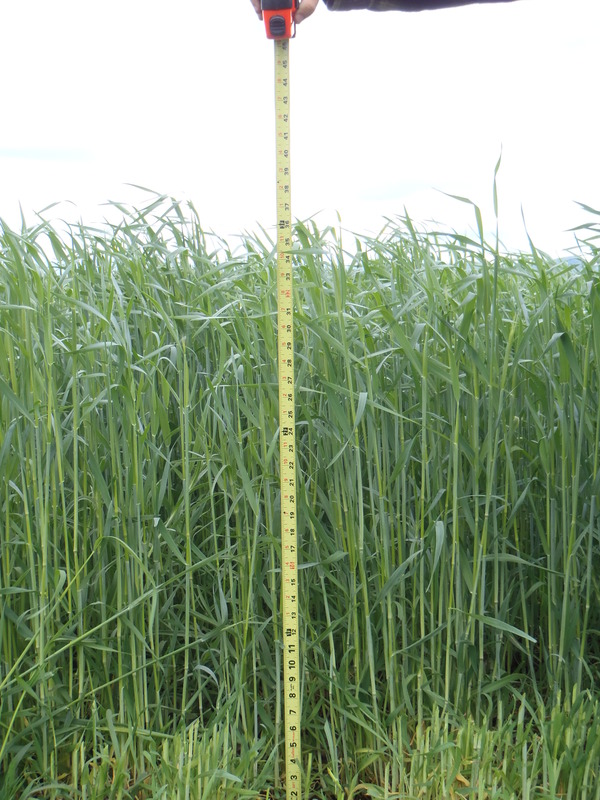 This winter rye measured in at 36″ at harvest time during the split boot stage. It yielded almost 2 dry matter tons per acre. statistically. Rye does yield higher. In one field where rye was planted right next to triticale in the same field, the rye produced 1.49 DM tons per acre while the triticale yielded 0.91 DM tons per acre. In our observations, triticale seed is often more expensive and harder to get a hold of. Although, that may change as more producers purchase it over time. We found that seeding at higher rates closer to 150 pounds/acre gives higher yields and better quality (higher protein, lower NDF) than fields seeded at a lower rate of 100 pounds per acre. An additional one or two dry matter tons per acre of quality feed is not a bad return on the investment of seed. Add to that the erosion prevention you accomplish over the winter and early spring, the nutrient recycling that occurs, and the soil health benefits of increased organic matter, better soil structure, and it seems like it makes sense in most cases. If you are unable to harvest these crops as forage and must plow or burn them down with herbicide, they can contribute significant amounts of nutrients back to your soil profile, enabling you to reduce fertilizer inputs. Rye provided 45 to 90 pounds of nitrogen, an average of 9 pounds of Phosphorus and 80 pounds of potassium; while triticale provided an between 45 and 65 pounds of nitrogen, 5.5 pounds of phosphorus, and 45 pounds of potassium (per acre). All in all, a well-managed rye or triticale crop can improve soil health, water quality, and could become an important part of your feeding program. We will keep you posted as we continue to look at these cover crops in Vermont. Winter triticale that was drilled into a pasture in September being rotationally grazed the following May. Four separate fact sheets are now available from Sarah Flack’s presentation at our April 1st Grazing Symposium. Simply click on the links below to view them. $20 registration includes a hot lunch and some great door prizes. 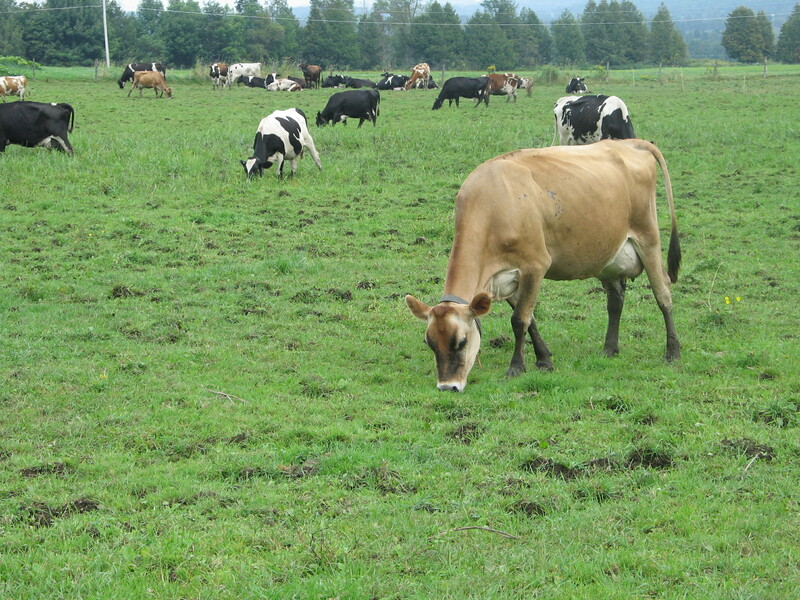 Join the discussion and step up your grazing skills this coming season! Come hear grazing expert, Sarah Flack provide helpful tips to fine-tune your existing grazing system. 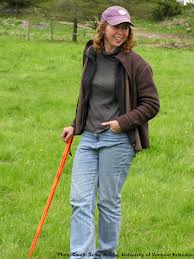 She’ll also discuss the most common grazing mistakes and how to avoid them for increased pasture potential. Sarah has a diverse background in sustainable agriculture, which includes both on-farm and academic experience. Her current work includes writing, public speaking and consulting with farms and organization to help farmers transition to new methods of farming including grass based, diversified, and organic. She also works with several organic certification organizations as a consultant, and inspector. 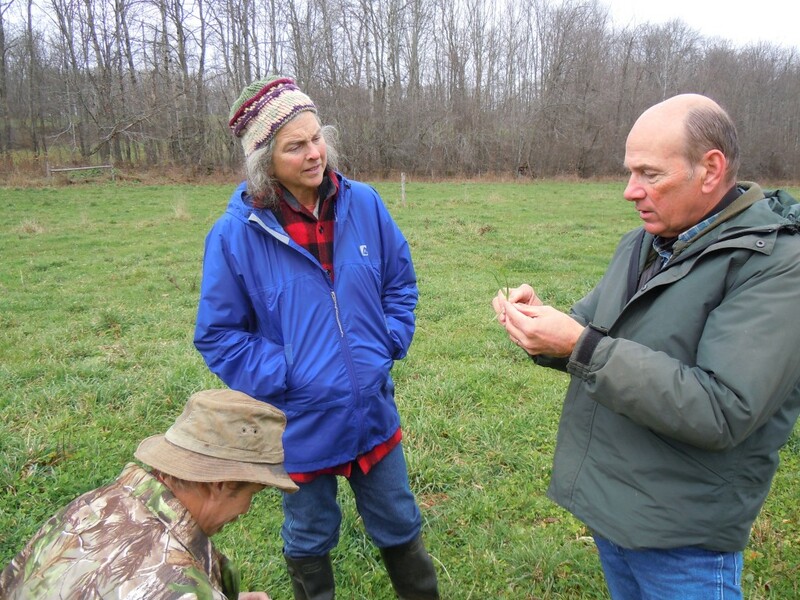 She received her master’s degree in Plant and Soil Science from the University of Vermont, where she studied grazing management with Dr. Bill Murphy. 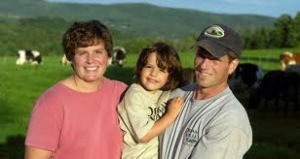 Farmer Brent Beidler of Randolph Center, Vermont will discuss his successes with annual crops such as millet, forage oats, turnips and others to increase overall pasture productivity. Brent will also cover the importance of variable paddock sizes and how he maximizes forages to minimize grain feeding. In addition to dairy production, the Beidlers have also ventured into growing grains and milling flour on the farm. Brent has played an important role in the formation of the Northern Grain Growers Association. or call Donna at 388-4969. UVM Extension Grazing Specialists Kim Hagen and Cheryl Cesario (taking the picture) spent the day last week with Willie Gibson of NOFA-VT and grazing expert Darrell Emmick from NY state. The group visited an organic dairy farm in East Montpelier and a grass-fed beef operation in Waitsfield. They spent a whirlwind day discussing topics such as large herd grazing planning, forage quality and quantity, and reclaiming pasture land.